Robinson, 38, is a decorated Air Force veteran and recipient of the Airman’s Medal for the time she pulled her colleagues out of a burning plane in Iraq. She now lives in Quinlan, with another infant and three step children, aged six to nine. But her marriage had been undergoing a turbulent period lately, which culminated in a shoving match with her husband several days prior to the incident. Apparently, one of the kids told a teacher at school, who then reported the couple to Child Protection Services. She was arrested on March 4 on charges of resisting arrest, assaulting a police officer and interference with child custody, and spent some six days in jail. The court case was over her 18-month-old son, Landry. The rest of the children are now in protective custody, while the infant son, Levi – who was born less than a week after her release from custody, is with grandparents. That evening, child services officials showed up at Robinson’s home, accompanied by sheriff’s deputies, to take Landry away. "I'm 38 weeks pregnant, and with my stomach again repeatedly pressed into that counter, and with my 18-month old son watching his mother be assaulted, and him screaming in fear," she says. "There's nothing that warrants what they did to me." She remembers the officers telling her ‘We’re here to remove your son,’ and her replying, ‘Nobody is touching my kid without a court order or a warrant.’ The officers reportedly did not present any papers and, when she tried to shut the door on them, forced their way in. She tells WFAA: “I’m positioning myself in front of my child as the officers are screaming, ‘There’s the kid, grab him!’” That’s when they proceeded to handcuff her as she was pressed up against the kitchen surface. The police, however, had a different narrative to the story: that Robinson was reaching for a weapon. The evidence will be reviewed to establish the truth. The sheriff later told reporters he was not sure what went down, but that the unidentified deputy said Robinson had loosened his ammunition belt in the chaos. 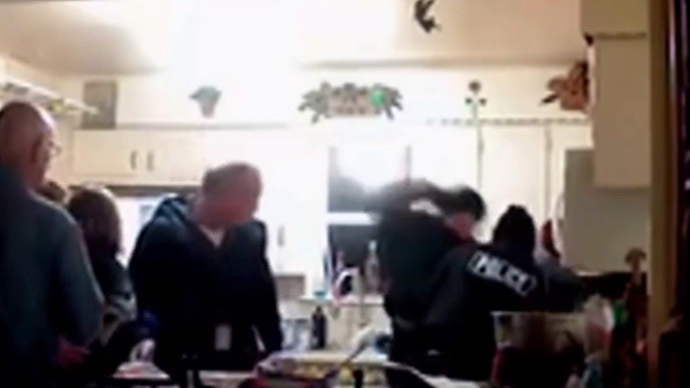 In the video, Robinson can be seen struggling with the officers, something she only says she did because the pressure they were applying when pressing into her was hurting her unborn child. She later told reporters the officers hit her five or six times. The video cuts off just before the deputy’s hand comes down on her a second time. Robinson also reported lingering pain for weeks, and her stomach appears to show bruising from the incident. She’s thankful Levi is a healthy child. “It certainly could have turned out differently.” She says she misses her kids very much and that she’ll be pushing for the officer responsible for hitting her repeatedly to be fired. Dozens of calls came to the sheriff’s department following the release of the video. Hundreds of concerned citizens also posted on the department’s Facebook page, voicing outrage, while the town of Quinlan also saw people go out on to the streets, encouraging others to view the video. The sheriff department’s Facebook page showed a statement from Sheriff Randy Meeks, saying that all such cases are handled with the utmost seriousness and that an investigation is under way to determine “if any violations occurred.” He promised to make the findings public. Robinson’s attorney Carol Gustin told reporters “There’s no reason in my mind that an officer should pull his hand up above his body and hit a pregnant woman multiple times. Law officers are there to protect and serve. Where was the protection for her and this baby?" CPS was onsite when the incident with the police took place. Cornuaud wonders why they did not intervene when a pregnant woman was being hit. The services offered no comment on this.